Real Ale, Curry as Well—-Sophisticate! what’s the reference to the algonquin about? and if your gonna refer to it why isn’t it you cant get it translated into algonquin? if the US government wanted the language to be protected to preserve for americans, why did he pay a lakota to reconstruct it? is it cause of those pages that were found so long ago? 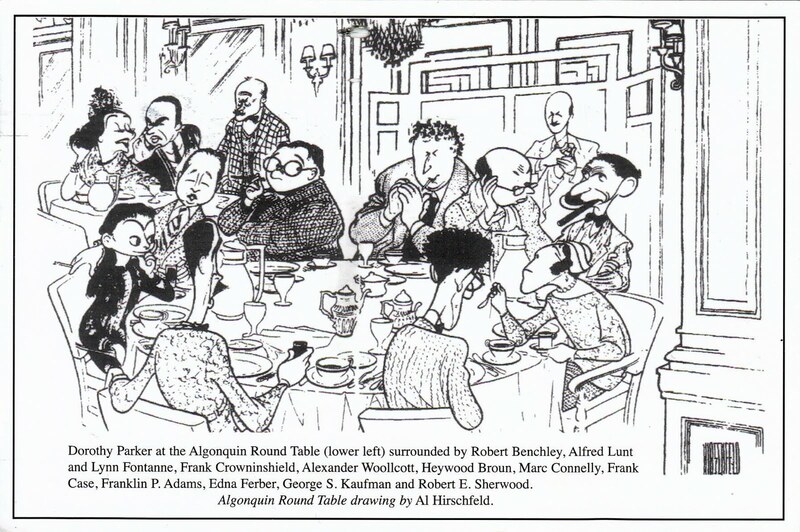 The Algonquin to which I refer is a New York hotel, which used to host a rambunctious group of writers, shown in the drawing above. You can read more about it by clicking on “The Original Roundtable” link. Your comment intrigued me so I did a little research and found that no Algonquins ever lived in New York—I cannot say what inspired the hotel’s name. As to the translations available on this page, alas, I am at the mercy of technology. I myself am not familiar with the Algonquin language, but my loyal readers will testify to my strong beliefs about the link between language and individual and group identity. I hope the First Nations’ push to preserve their languages helps to keep them alive. It is a tragedy when any language is lost. Meegwetch for stopping by and tanakia as well.